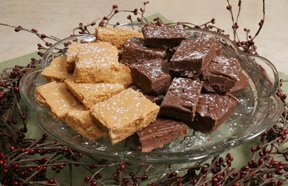 This fudge recipe is an easy to make version of the popular sweet treat. It can be prepared as chocolate or butterscotch flavored just by using the appropriate flavored chips. Make both flavors for a nice pairing of flavors to satisfy everyone's taste. If you have never made peanut brittle or need some help on getting it right, let us show you the steps and give you the help you need for perfect peanut brittle. See how easy it is to make these fun Christmas treats for everyone to enjoy this holiday season. We will show you how simple they are to put together.